Team Honda Research partnered with Honda Performance Development to showcase the B-Spec Fit developed specifically for Rally competition at the New England Forest Rally (NEFR), the sixth round of the Rally America National Championship. “We had a fantastic 2013 season, where we were able to finish first in the B-Spec National Championship and fourth in the 2WD overall National Championship. We wanted to come back and build on that success by refining the B-Spec package for the Honda Fit," stated James Robinson, Honda Engineer and driver for THR. In the first 5 rounds in the 2014 Championship, the B-Spec Fit collected four wins and two overall 2WD podium finish at the Sno*Drift, and Oregon Trail events. Even having missed the Mt. Washington Hill Climb in June, all the team needed was one more podium finish to clinch the 2014 B-Spec Championship. 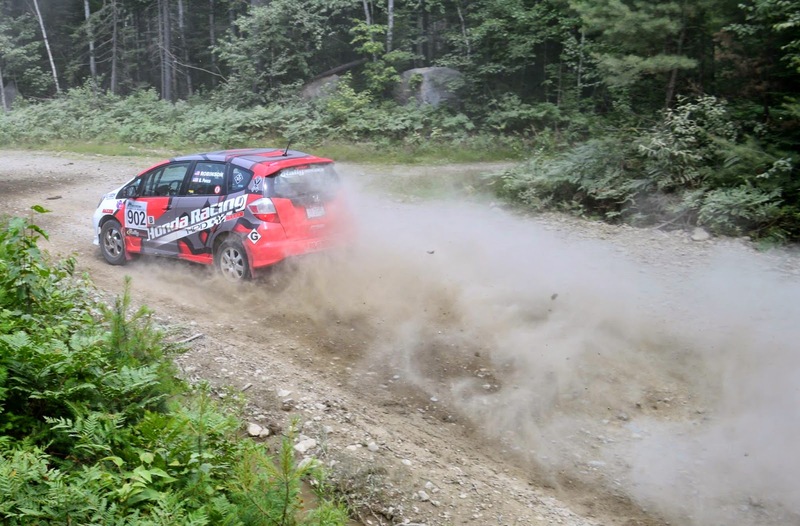 The New England Forest Rally (NEFR) marked the third event where THR and HPD partnered with Maxxis Tire to provide competition rally tires for the B-Spec Fit. “The Maxxis R19 Rally tire has worked well on the fast stages in Oregon and in Pennsylvania, so this weekend will be the real test for the durability of the tire,” Robinson said before the start of the first stage. Moving through the second day, the B-Spec Fit maintained a competitive pace in 2WD but was predictably unable to reel in the hard-charging Fiesta of Duplessis. Finally, the Fit was able to finish 2nd in B-Spec, 5th in 2WD and 12th overall. “Although we were hoping for a win today, we’re ecstatic about making it through the event without any huge issues, aside from our front suspension,” Robinson said at the awards ceremony. “The Fit was totally reliable over the whole event, and we had great success with the Maxxis R19 tire. Look for the THR B-Spec Fit at the next round of the Rally America National Championship Series, August 21-22 in Detroit Lake, Minnesota. The sixth race on the Rally America National Championship schedule and always a favorite with drivers due to the technical demands of the course, the New England Forest Rally offers challenging logging roads with some of the longest stages on the Rally America National Championship. This rally is also a crowd pleaser because of its stunning scenery and wildlife. Quintessential northeastern settings such as winding creeks and one-lane bridges add not only beauty to the race, but also excitement, when encountered by drivers at breakneck speeds. Based in Williston, VT, Rally America, Inc. sanctions the Rally America National Championship, which consists of at least seven national-level events located at a variety of venues across the country, from Portland, Oregon to Newry, Maine. Top competitors in the Rally America National Championship reach speeds of well over 100 miles per hour, driving highly modified street cars such as Mitsubishi Evolutions, Subaru WRX STIs, Ford Fiestas and Scion XDs on natural-terrain courses consisting of gravel, dirt, ice or snow. For more information regarding Rally America’s National Championship or the sport of performance rally, visit www.rally-america.com.